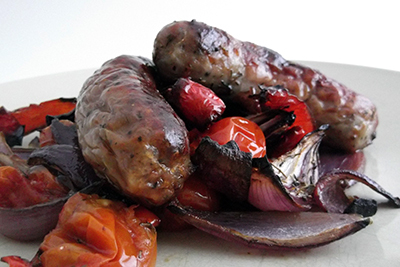 I like doing different things with sausages, instead of the usual hotdogs or sausage and mash, so here’s a simple recipe which makes tasty roasted sausage and veg. I scaled the recipe down for just one person as I made it for myself when my husband was out for the evening. He’s not a fan of onion so I thought it was a good opportunity. The recipe below however serves 4. Turn oven to 200C, GM6. Put the onions and peppers in a roasting tin, drizzle over the oil and vinegar and season well. Roast for 10 minutes. Put the sausages, tomatoes and thyme in and around the vegetables, drizzle over the honey and cook for 30 minutes more or so, turning the sausages after 15 minutes, until the sausages are cooked and everything is golden and sticky. With mustard mash or crusty bread. I used dried thyme as I didn’t have fresh, I used maple syrup instead of honey (as I don’t really like honey), and scaled the recipe down for one person. This was really yummy, with sweet vegetables and meaty sausages. I will definitely be doing it again. The balsamic dressing worked really well. Plus it was quite easy to do as well, as everything was on the one tray. Great for a midweek meal providing you’ve got a bit of time for it to cook in the oven. Looks delicious! I love balsamic dressing. It looks yummy! Just my kind of food! 🙂 I will try that with the wild boar and apple saussage from the butchers.